Hardide Coatings is the leading global innovator and provider of advanced tungsten carbide coatings that significantly increase the life of critical metal parts. They have production facilities in Oxfordshire UK and Virginia USA and service a number of industries including aerospace, oil & gas and power generation. The original Hardide brand had proved extremely successful, being implemented from the company outset and serving to put them on the international stage for their industry. Like all brands, however, it required a refresh. In this case to create a new customer proposition, meet the needs of new management and to facilitate a successful new business drive with the creation of a new, fresher looking range of marketing communication. The challenge was to ensure the great results of the existing brand were not undone by the newly refreshed brand. Before any design work was undertaken Veucom worked with Hardide to create a brand new Customer Proposition to ensure that a consistent accurate message was produced. Veucom then took the decision to subtly change the Hardide brand with the introduction of a new colour way and implementing new look graphic devices throughout the entire marketing communications. To ensure that Hardide could communicate their message, the first stage of the branding refresh was to create a new Customer Proposition. Following workshop meetings with key staff, including the CEO and Sales Managers, Veucom created the new Customer Proposition, ensuring that it was concise, direct and conveyed the main features and benefits of using Hardide Coatings. The Proposition successfully positioned the company within the marketplace, communicating directly to the many target industries. With the new website set to be the main marketing tool, the Customer Proposition was created with this in mind, and written to aid SEO and better search engine rankings. As the existing brand had proved very successful, any change would need to be subtle and retain the same company logo. A change of corporate colours was proposed, transforming the existing stark black and red into a dark blue and magenta based red. Whilst the change was subtle, it allowed for a much ‘warmer’, ‘friendlier’ and more contemporary identity. It also allowed the introduction of the blue and red throughout the range of marketing communications. A series of graphic devices was devised to be used throughout the branded communications. This utilised the two new colours and consisted of flowing graphic lines and pictures positioned inside irregular curved flowing shapes, representing the swirling, gaseous phase of the Hardide coating process. Clean, white space was also used widely to create a more technical and scientific perception. A brand new website was designed to complement the brand refresh. The new website featured a revised structure and site plan, all-new content and a WordPress Content Management System platform to allow easy updating in-house. The design featured the new colour way and supporting graphic styling to ensure brand recognition and aesthetic consistency with all other marketing communications. The website content was optimised so that the key search words and terms provided the best possible results. This successfully produced several number 1 positions in search engine rankings. With field sales being a key part to Hardide building customer relationships, a new Corporate Brochure was designed for business development managers to use as a sales tool, in addition to being distributed by mail and throughout exhibition campaigns. 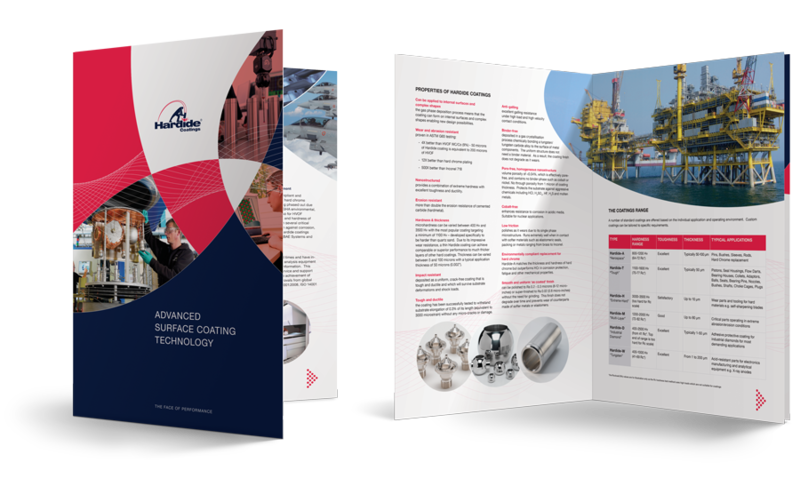 Using the new brand graphics, the 8-page brochure featured a pocketed back cover for the insertion of sales literature such as technical data sheets. Hardide Coatings attend many events throughout the year, taking space at targeted exhibitions and conferences. Veucom designed new exhibition stand graphics to complement the new brand, and managed the stand building and logistics, delivering a complete turnkey solution. Veucom designed a range of digital advertisements to appear on specific industry websites. Promoting the features and benefits of using Hardide Coatings, the advertisements used 2 stage gif graphics to convey the sales messages. Hardide plc, the parent company of Hardide Coatings Ltd, is listed on the London Stock Exchange AIM listings. For ten years, Hardide plc have chosen Veucom to design and produce their Annual Report. With each year presenting new operational and financial highlights, Veucom also works with the Hardide plc team to produce the themed messaging to integrate with the new design. As a key part of the branding project, new photography was proposed to enable Hardide to showcase their manufacturing facilities and technical capabilities. A series of photographic shoots were organised and shot within the UK and US facilities providing a valuable number of pictures to use throughout the entire range of marketing communications. The new website performance was extremely impressive from the moment it was launched. Data representative of first three months post website launch Google Analytics. * Key industry search terms including ‘Hard Chrome Replacement’, ‘wear resistant coating’ and ‘internal surface coating’. The new designs for the brand refresh provided a much fresher, distinctive and more technical appearance to the company, receiving much praise from Hardide plc board members and their customers. The new website provided immediate excellent results. Within the first three months of being live, website users had increased by a huge 267% over the previous three month period. Important key search terms, such as ‘hard chrome replacement’, ‘wear resistant coating’ and ‘internal surface coating’ achieved the number one spot in Google search results. The brand refresh exercise had an impact on boosting marketing led enquiries, with the new website generating a regular flow of sales enquiries via the online enquiry contact form. "From web design and annual report production to e-campaigns, Veucom delivers a professional, creative and friendly service."